Humans love collecting things. Go to any garage sale, estate sale or antique show and you will see people carefully inspecting items in vendor’s booths on tables or in boxes. As antique shows gradually become a thing of the past, the Internet provides a major outlet for finding antiques and collectibles. The Internet is especially helpful when what you collect is not common or easy to find. 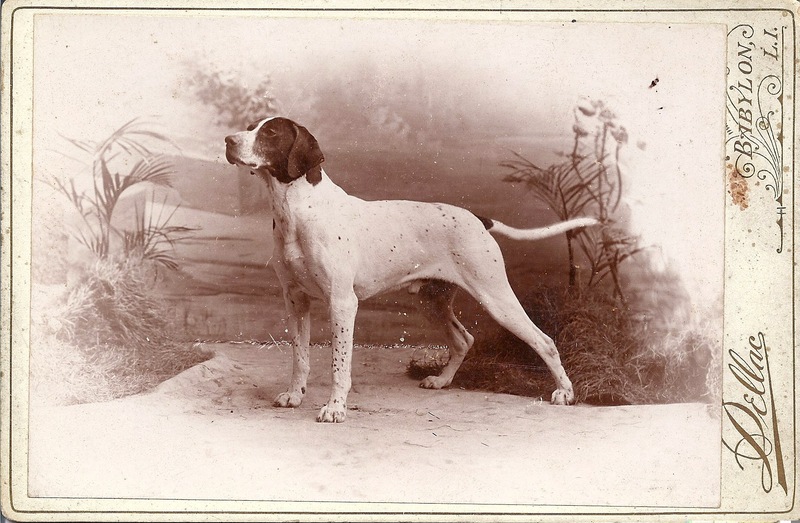 Collecting dog-related items has become increasingly popular over the past 10 or so years. Dog objects are fun items that dog lovers can use to personalize and decorate their spaces. The possibilities for collecting dog related items are endless. 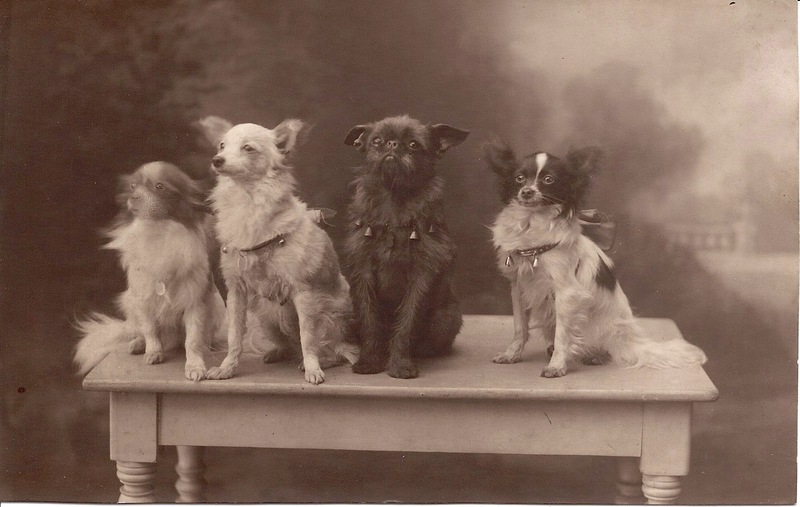 Today there are dealers who specialize in dog art, objects, books and photographs. While many people collect specific breeds or specific items, my collection is eclectic and includes different breeds and media. It consists of wood, metal and dog figurines, prints, paintings and photographs. Photographs are the primary focus of my collection. I have always loved old paintings of dogs but realized that most were beyond my budget. 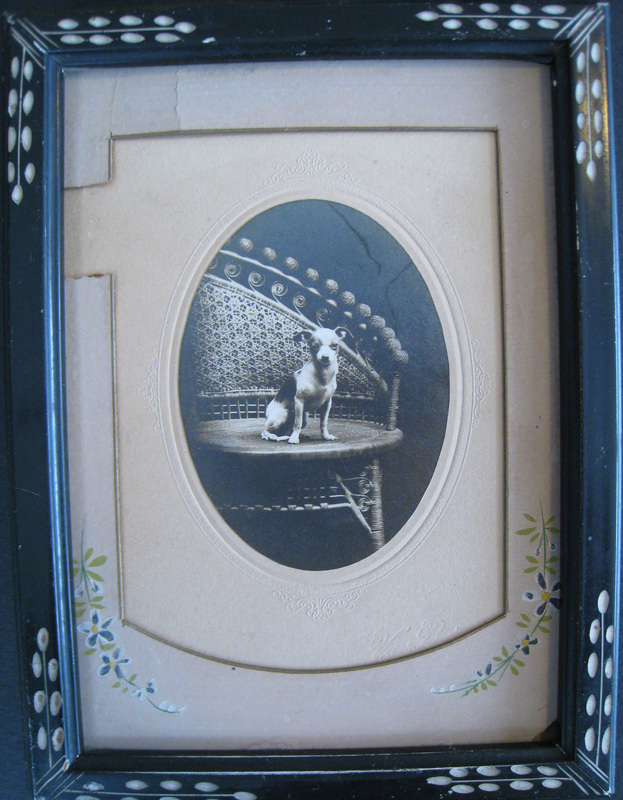 I started collecting photographs 8 years ago when I found a framed photo of a Chihuahua sitting on a chair. I paid about $10 for it and my collection began. There aren’t many photos for sale at antique shows so I was certain that it would take me years to build up a moderate collection. This pace would surely be better on my budget. I soon discovered E-Bay and an endless source for photos. My collection grew exponentially. I was drawn to photographs for several reasons. First they are much easier on my budget than a painting. They are more portable and ship easily and inexpensively. 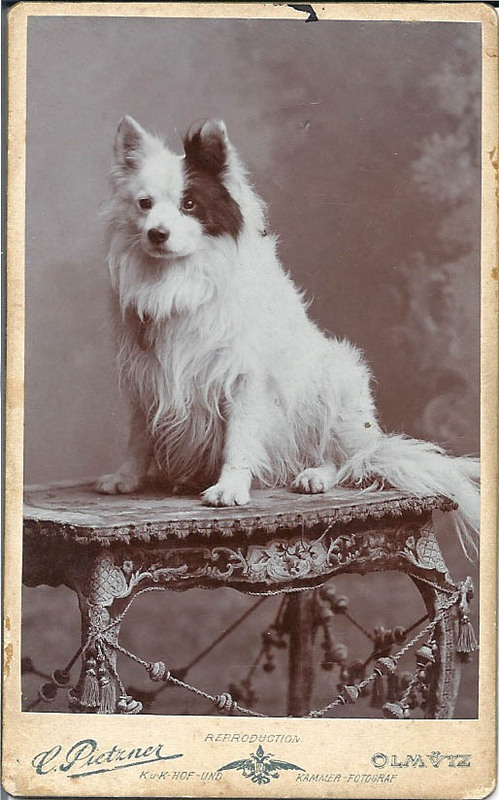 I was also intrigued by the fact that 100 or more years ago so many people cared about their dog enough to have them photographed by a professional in a studio setting. Often the dog is seated or lying on a piece of furniture or in front of a fake backdrop of woods, water, mountains or a grand interior. I primarily collect photos with only a dog or dogs in them but occasionally I buy one with a person or people in them. Within the field of photography there are many different types based on format and technology. Examples include Daguerreotypes, Ambrotypes, Tintypes, CDVs, Cabinet Cards, Stereographs, Albumen Prints, Dry Plate, Silver Prints and Real Photo Postcards. Although I collect black and white photos that span between 1850 and 1950 I am partial to three types of photos, CDVs, Cabinet Cards and Photo Post Cards. Carte de Visite (CDVs) were introduced in 1854 and were made until about 1905. They are albumen prints mounted on a 2-1/2” by 4” card. The cards are often printed or embossed with the photographer’s name or studio name. Cabinet Cards were introduced in 1863 and were made until the early 1920s. They are made using a wet-plate negative on albumen paper that measures 4” x 5-1/2” and is mounted on a 4-1/4” x 6-1/2”. The size of the mount can vary for either type of photo. Both CDVs and Cabinet Cards were produced in photographer’s studios. Photo Postcards were first introduced in 1900 and remained popular through the 1940s. They are real photographs that are developed onto photo paper the size and weight of a postcard with a postcard back. Postcard photos were created by professional and amateurs alike. Without proper care photos will not last. They need to be stored or displayed out of direct light in dry, temperate spaces. Some antique and art dealers specialize in animal related items. Far fewer specialize in dogs. This entry was posted in Antiques and Collectibles and tagged antiques, collectibles, dogs, photography. Bookmark the permalink.